Kupka’s Piano aims to entice audiences into hearing new sounds, new structures, new musical ideas. We work collaboratively to make art that moves. The Human Detained is a collaboration between Brisbane-based contemporary music ensemble Kupka’s Piano and MakeShift Dance Collective. Named after the 1909 painting The Piano Keys by Bohemian artist František Kupka, Kupka’s Piano focuses on work by young contemporary composers. MakeShift is a small group of dance artists and guest collaborators, dedicated to contributing to independent dance in Brisbane. Four new compositions were presented in the following order: Kicking Gaols by Steve Newcomb; Thin Lines of Ours by Brodie McAllister; The Binds That Tie Us by Samantha Wolf; and For Reza Berati by Michael Mathieson-Sandars. The ‘human detained’ theme was sometimes loosely and at other times more literally interpreted. 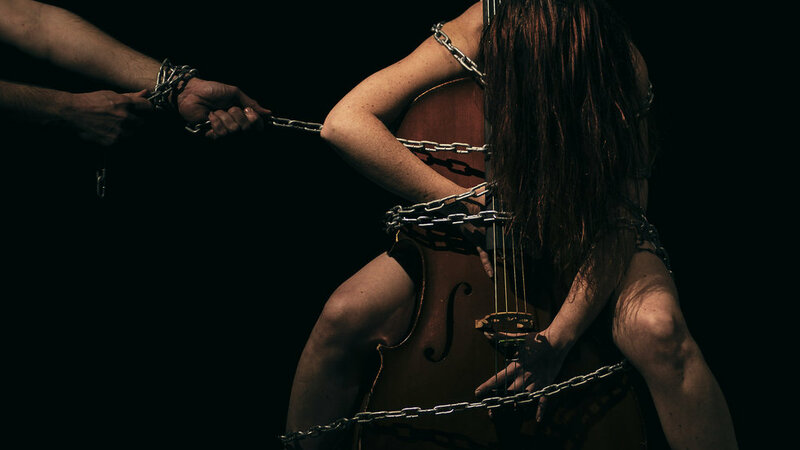 The piece most fully realised theatrically was The Binds That Tie Us (performed by pianist Alex Raineri, and dancer/choreographer Gemma Dawkins). Raineri and Dawkins are seated at either end of a table, with a glass bowl of eggs on the table between them. At first the performers seem to be playing a competitive game, snatching eggs out of the bowl in turn, and arranging them in lines. Throughout, Raineri plays a range of keyboard instruments, including a toy piano with a very plaintive, lost sound. The haunting music plinks and plonks like an accompaniment for dolls dancing. Moving away from the table, Dawkins places eggs in a circle around her, as if creating a barrier. She finally puts them in a line, and then slowly and hesitantly breaks them one by one in various ways – for instance, she steps onto one, and then bends to press the next one with her hand. The hollow sounds of the eggs scraping, clicking and rolling, and the wet crunches as they break are a significant part of the whole soundscape of the work. Eggs are a powerful symbol of new life, but also of fragility. Deliberately breaking them feels like a transgressive act. The idea of making barriers out of them emphasises the illusory nature of some boundaries, and how easily they can be broken. The most literal interpretation of the theme of detention is For Reza Berati, which is a demand for justice, respect and dignity for asylum seekers, and a protest against their detention by Australia. It also honours the memory of Reza Berati, an Iranian asylum seeker who was killed in the detention centre on Manus Island in 2014. Jodie Rottle (flute) and Alethea Coombe (violin) at first appear like gaolers, pinning dancer/choreographer Courtney Scheu to the ground. She escapes, rolling on the ground and lying curled in a foetal position. Some of her later movements look like supplications, and she bends her head forward submissively. Gradually, as they play, Rottle and Coombe begin to also make louder and louder breathy noises that transform into spoken words, such as ‘No!’ and ‘No fear!’ They also stamp their feet. The sincerity of the work is plain, but this section is repetitive, and too long. Kicking Gaols features Angus Wilson on vibraphone, and dancer/choreographer Caitlin Mackenzie. The composition is electroacoustic, also using a laptop programmed to respond to particular pitches from the vibraphone, and to incorporate ambient sound recorded on a visit to the former Boggo Road Gaol. The metallic bars and tubular resonators of the vibraphone visually echo the bars of a prison. The sounds of the vibraphone are like temple bells and gongs, and soothingly meditative at first. Mackenzie appears, lying behind the vibraphone, and then dances in oscillating or rebounding movements, as if hitting an invisible barrier, recoiling and repeating the movement. Thin Lines of Ours is an intense piece for dancer/choreographer Gabriel Comerford and clarinettist Macarthur Clough. With compelling energy and control, Comerford conveys a sense of struggle, using circling and contracting patterns of movement. Music and dance interludes separate the main works on the program. The most memorable is Interlude II, where all the performers walk on stage in a line, whirling plastic tubes that make eerily beautiful sounds like unearthly voices. The visual design of the show is very understated (no designer is credited). The musicians and dancers are plainly dressed in loose tops and skirts or pants in combinations of brown, burgundy, and grey. The hour-long performance of The Human Detained passed so quickly that it finished before I realised. With the interludes, there are nine different items, which makes for a varied and generally fast-moving program. The composers and compositions are given prominence in the brief printed program, with the dancers/choreographers and the musicians credited only in a list of the members of each ensemble. I found the show engaging and intriguing, but it was difficult to work out who was doing what, and also to distinguish when the different items started and finished. More information in the program, and perhaps some clearer way of distinguishing between interludes and the main items, would help the audience to better appreciate the performance.